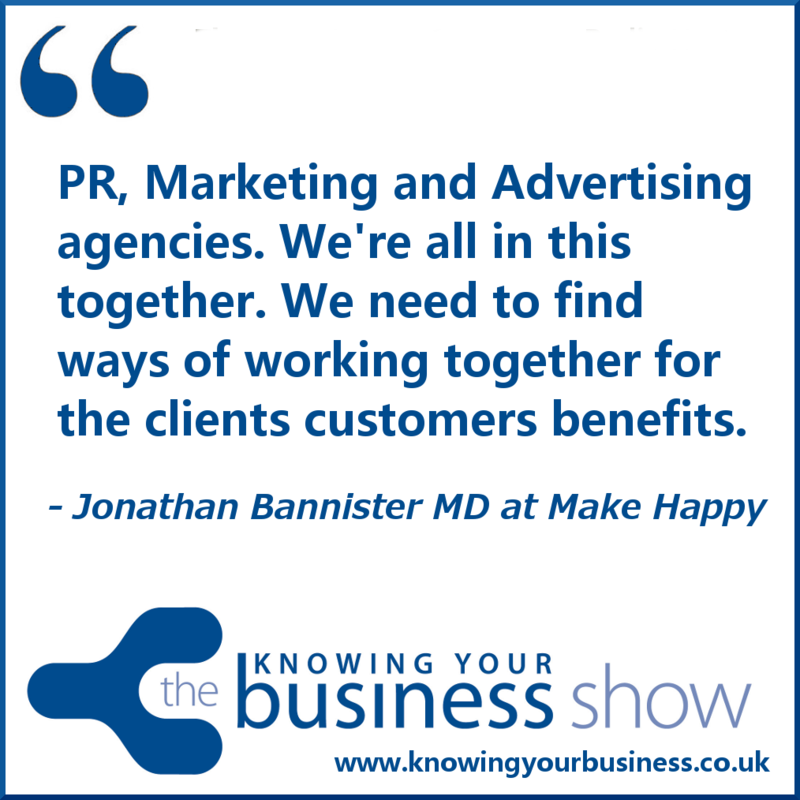 Compelling radio interview with the Managing Director at Make Happy Ltd Jonathan Bannister. We wanted to discover how the new PR relationship with marketing works in this new business communications age. We heard a whole lot more than that. We heard how marketing. PR, business culture and advertising all interweave as one. This interview was broadcast live on Radio Horton 2nd April 2015. The podcasts are available further down the page. Asking the all important questions is regular Knowing Your Business Show guest presenter, and marketing & PR specialist Tracey Lee. Jonathan defines marketing. A worthy listen as Tracey extracts an insight in this 2;46 second snippet. 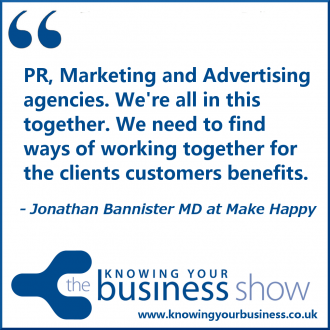 In this 1:15 snippet Jonathan gives us his thoughts on advertising agencies. We here Jonathan’s thoughts on sponsored content in this 2;35 second clip. Over twenty years experience creating advertising, marketing and communications solutions for B2C and B2B clients in Europe and Asia Pacific. A strategic marketer whose passion is to help brands and organisations innovate their business models and create intimate long-term relationships for their customers and all their other stakeholders by driving deeper levels of engagement. Business model planning and innovation, brand planning, strategic planning, communications development and planning, community building, change management, creative development, digital marketing, brand positioning, brand identity and marketing, creative problem solving, positioning, new product development and innovation workshops. This show online presence is being supported by partner Adapt Communications. This week, the Knowing Your Business Radio Show has been presented by Ian Gentles and guest presenter Tracey Lee. Often known as somebody who spends a lot of time in online social spaces who also has a deep interest in the spaces where technology, culture and big ideas overlap. Tracey Lee owner of Adapt Communications based in Oxford. Passionate about branding, life-long learning, jazz & cake! Loves radio presenting. Adapt is an Oxfordshire based, full-service, marketing communications agency, dedicated to making sure your company continues to adapt the way it communicates, in order to drive sales and grow your business. Adapt Communications helps you decide which methods of communication will be most effective to help your business raise its profile, increase the level of enquiries and most importantly drive sales. Adapt work with a variety of companies from very different industries, mainly B2B, some B2C – the common thread is that they all want their message to be heard loud and clear. Clients include: Blenheim Palace, Cornbury Park, FROM, The Revival Company, Kemp & Kemp Property Consultants/Kemp & Kemp Residential, West Oxfordshire Citizens Advice Bureau & NFU. Specialties: Brand Development, strategic and tactical marketing & PR. Web design & build. Copy writing for marketing collateral, editorial, websites and event Management. On a personal basis Tracey is a Trustee of www.archoxfordshire.org.uk and also enjoys freelance writing & radio presenting. If you have any questions for Jonathan, or would just like to leave a comment, please do.